This collection features musical theatre repertoire by some of Broadway’s best composers, perfect for auditions or performance. These are the songs that singers young and old, male and female, love to sing - freshly engraved with clear, playable piano parts. Includes a full page of background information for each song about the composer, the show it came from, and the character who sings it. 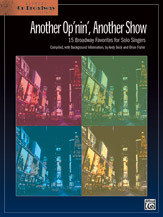 A must-have for beginners and pros (with or without the recorded piano tracks). Songs include: Almost Like Being in Love * But Not for Me * The Colors of My Life * Hey There * I Got Rhythm * I Only Have Eyes for You * Make Them Hear You * Send in the Clowns * Try to Remember, and more!